#SheBelieves Cup Watch Party at Reggie’s – 3/2 @ 3:30 p.m.
Saturday 3/2 – meet us at Reggie’s (2105 S. State St.) 3rd floor at 3:30 p.m. for the #SheBelievesCup match between USWNT and England. Reggie’s is our Pub to Pitch location all season, so come by and get familiar! Buy your season pass to ride or just support the endeavor. Reggie’s Pub to Pitch 2019! We have VERY exciting news! Thanks to our friends at the Red Line SG, we’re offering Pub to Pitch service for all Red Stars games in 2019! Buses will run from Reggie’s (2105 S. State St.) to SeatGeek Stadium and return to Reggie’s after the match. The Red Line SG is currently selling season-long bus passes for all 12 regular season CRS home games. This pass is the only way to guarantee yourself a seat on the Reggie’s bus all season and lock in the $5 per game rate. What time will the bus leave from Reggie’s? / What time will the bus get to the stadium? Generally the bus will leave Reggie’s about 2 hours before kick-off and leave 30 minutes after the final whistle. This will give you a chance to tailgate before the match starts. Can I buy additional tickets for a single match? Yes, single-game bus tickets will be available for $7 in advance, or $10 on the day of the game. What if I don’t need 12 bus tickets? The tickets are transferable, so you can give or sell them to someone else! It’s the first year we’re doing this for Red Stars games, so even if you can’t make all the games, consider buying the pass to show Reggie’s & other bars that there is a market for Red Stars pub to pitch service. Season kick-off party is March 9th from 2-4pm at Timber Lanes! Join us for free bowling and free pizza. Event open only to dues-paid Chicago Local 134 members. Not a member? Sign up here or at the door. 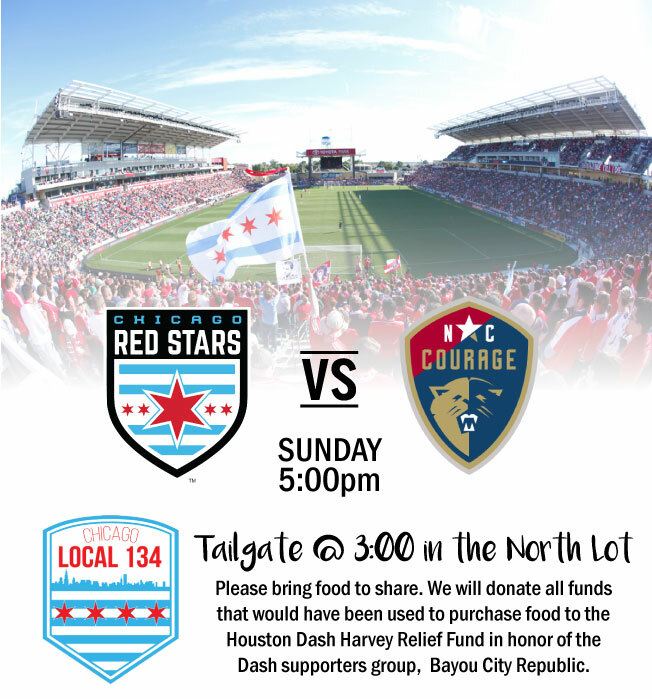 Chicago Local 134 invites all Red Stars fans to the tailgate in the North Lot of Toyota Park this Sunday @ 3:00pm. Instead of providing food, Local 134 asks that you bring something to share. All money that would have been used to purchase food will instead be donated to the Houston Dash Harvey Relief Fund in honor of the Dash SG, Bayou City Republic. My name is Janine Beckie and I am proud to represent Houston as a member of the Houston Dash, Hurricane Harvey has devastated Houston and South East Texas over the last three days and will continue to have a lasting impact on our community, time is of the essence for the people of Houston that find themselves caught in this disaster. As athletes we have an opportunity to mobilize our resources, contacts, family, and friends to come together and model the most basic obligation we have as human beings: to take care of one another. These are our people, this is our city, this is our home. Please donate, something small, something large, your generosity will make the difference as we begin to find our city again, one step at a time. 100% of funds raised will go straight to the Hurricane Harvery Relief Fund created by Houston Mayor Sylvester Turner patnering with the Greater Houston Community Foundation. This money will provide the most pressing needs for Houstonians. Thank you everyone for your generosity and love! Come together, we are #HoustonStrong.